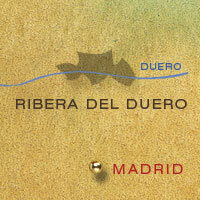 We seem to say it about every Spanish region, but Ribera del Duero (the banks of the Duero) is one of Spain's most exciting wine regions. Located an hour's mule ride and a bit from Madrid, the cultivation of excellent reds from the Tinto Fino variety (Tempranillo by any other name) has gone on here for centuries, with the King's court happy to slosh them down their tunics and not share them with the world. But since DO status was awarded in 1982, along with compulsory legwarmers for the cold winter nights, the region has come on in leaping bounds. The key here is the landscape; it is very, very high here, and despite searing summer heat, the altitude and the cool nights mean the grapes develop flavours and concentration that would just blow out otherwise. The aromatics in particular can be swoon-inducing, with the great wines explosively heady, intoxicatingly exotic, spicy, sweet-edged and opulent.